"They say it will take one and a half hour to reach the airport from here? ", says Pullela Gopichand as he is in Mumbai and worried if he'll make it in time for his flight. Back in Hyderabad, he works at his academy situated on the outskirts of the city. No question of traffic snarls in his hometown. From March 1, 2018, the Badminton World Federation (BWF) will begin testing a new service rule which makes it mandatory that the shuttle should be below 1.15 metres from the surface of the court at the time of it connecting with the server’s racket. While this rule brings uniformity of judging from the umpire's perspective, it also means taller players, like PV Sindhu, will have a hard time in adjusting to the low height while serving. Gopichand reckons the rule was necessary in the larger scheme of things. "It's something that I agree with, there is a certain advantage. Whether it's 1.15 or 1.25m is another point of debate. The fact is, there's too much of doubt regarding the serve in general. Some umpires would call it fault and some didn't." "There was no clarity from a players perspective. How taller players could be affected is another issue but to have standardization of judging the serve is very important," he told Sportskeeda. Recently, The Badminton World Federation (BWF) released their revamped tournament calendar for 2018 with a host of changes, chief among them being, the top 15 players in singles and top 10 in doubles will have to compulsorily play 12 events in a year. Add to that, qualifying rounds for certain important tournaments have been scrapped, citing time issues. This leaves the predicament of players ranked outside the top 32, hanging in the balance. Gopichand though isn't happy with the new calendar. "It's difficult to preempt what will happen, we have to see how the system works. What happens when injuries happen? There have been cases where people have come out from qualifying and won tournaments -- what will be the impact on these kinds of players? This needs to be looked at," he stated at an IDBI Federal Life Insurance event. On 16 November this year, which also happens to be Gopichand's birthday, it was announced that a movie based on his life is in the works. The biopic will be bilingual (Hindi and Telugu). Gopichand spoke about the man who is set to essay his role in the movie. "There is a player who played the game during my time, his name is Sudheer Babu. Sudheer is somebody who has watched me from close growing up and he's been my training partner before the Olympics. I think him playing would be good," he told Sportskeeda on Wednesday. Sudheer was Gopichand's doubles partner at one time and was also ranked number 1 in Karnataka. He is now an actor in the Telugu film industry. While it's the athletes who usually act as the face of a sport. 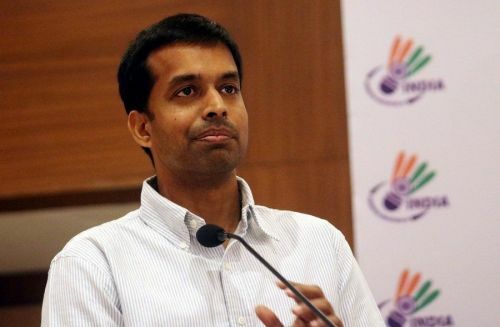 India's Chief National coach, Gopichand who retired from badminton way back in 2003 is still in many ways considered to be the face of badminton in India. But with success come the expectations. Known for churning out champion players, Gopichand now finds himself in a situation where he is required to alter his training methods based on world standards. After all, the players under his tutelage are global superstars now. "At the highest level, much of what you pick up is intuitive and also from other sports. For me, input comes from various fields, for training methods, we look at other sports like fencing, handball and football. I pick some of their training methods and I also have some Canadian friends who help me with the training methodology," he signed off.